According to the American Heart Association, you can never start too early when it comes to heart health. It may be surprising to learn, but plaque deposits (atherosclerosis), can begin building up in the walls of the arteries in children as young as five years old, leading to coronary heart disease. 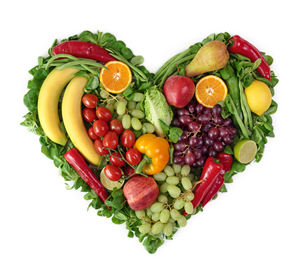 In addition to regular exercise, diet can help lower the risk of heart disease later in life. Children age two years and older should be encouraged to eat at least five servings of fruits and vegetables daily as well as a wide variety of other foods low in saturated fat and cholesterol. Doing this can help maintain normal blood cholesterol levels and promote cardiovascular health. Eat plenty of fruits and vegetables, which are high in vitamins, minerals, antioxidants, phytochemicals, and pectin (a soluble fiber). Choose whole-grain foods like steel-cut oatmeal, which are a good source of dietary fiber. Eat fish for heart-healthy, omega-3 fatty acids. Limit saturated and trans fats such as fatty cuts of meats, whole milk, cheese, butter, lard, ice cream, coconut oil, and palm oil. Trans fats are found in deep fried foods such as doughnuts and French fries. Look for “partially hydrogenated oils" on ingredient labels and stay away from those foods. Limit your red meat intake and choose lean meats, fish, and poultry. Try meat-free alternatives such as tofu, beans, lentils, quinoa, and tempeh for protein. Snack on nuts! High in healthy fiber, protein. and healthy mono-unsaturated fat. A one ounce serving size of nuts is about 28 almonds or two tablespoons of nut butter. Add flax seed to cereal or fruit smoothies for a high fiber, healthy fat boost! Making smart choices every day has a big impact on heart health. Develop proper eating habits early in life for better heart health.